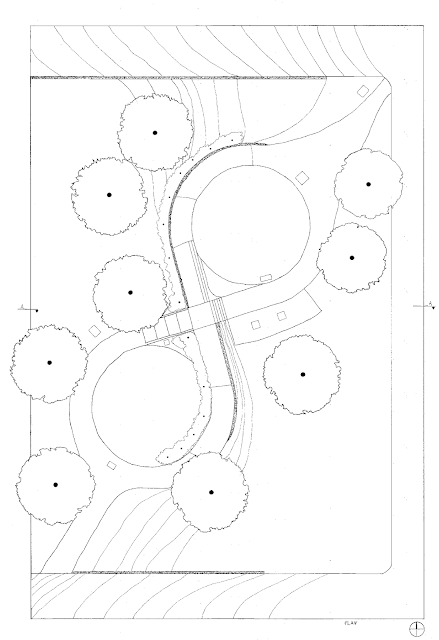 The design for the Noguchi sculpture garden was based off of the idea of combating placelessness with timelessness and getting lost in Nature. Noguchi’s cultural isolation led to him create sculptures and work with designing parks. The design of the sculpture pulls from Noguchi’s work and remains true to the nature of the Nelson Atkins. The sculpture garden functions as an extension to the Museum, but also as a refuge for nature and art enthusiasts alike. The designs were hand drafted and the model was also created by hand. A hand drawn Section of the area.